My husband and I were in a hurry to purchase and move into our first home before our wedding. (We ended up renovating a fixer-upper while simultaneously planing the details of our Big Day. I blogged about it here for The Nest). Every house in our target location and price range seemed to go up for sale and then off the market within a day. That’s how quickly homes were selling. It wasn’t in a flood zone. There was a disconnected basement and an attic for storage (this was huge because most houses we were looking at didn’t have storage). The house had three bedrooms, so we could make one an office. The spacious yard provided plenty of room for our dogs. There’s one major checklist item we neglected to consider: the bathroom. The house had one, so really that’s all that mattered, right? Wrong. Our small bathroom only has a shower stall. We didn’t even consider the fact that in the near future we would have a tiny little person who couldn’t stand in a shower. The first few months after Genevieve was born, we made-do by using an infant tub in the kitchen sink. But she soon outgrew this and wasn’t able to sit up and play in the water. Online research led me to TUBTRUGS. These flexible, strong tubs are 100% phalate-free and food-grade plastic, so they’re safe for pets and kids. I even found a video on YouTube of a mom bathing her kids in one. Problem solved! Genevieve loves playing in the bath now and I’m so happy we found a solution for our small space. This is very popular in Europe, where most homes are shower-only. At least that’s what I’ve gathered from the Internet! 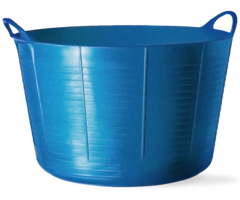 When she outgrows this and begins to use the shower, we can still use our TUBTRUG during outings to the beach or outside in the yard. It’s a great investment and so much more affordable than a bathroom renovation! Next PostThe Beebo Hands-free Bottle Holder: Working Mom’s Best Friend?